Separate elements form a closed circle, like people in a community. 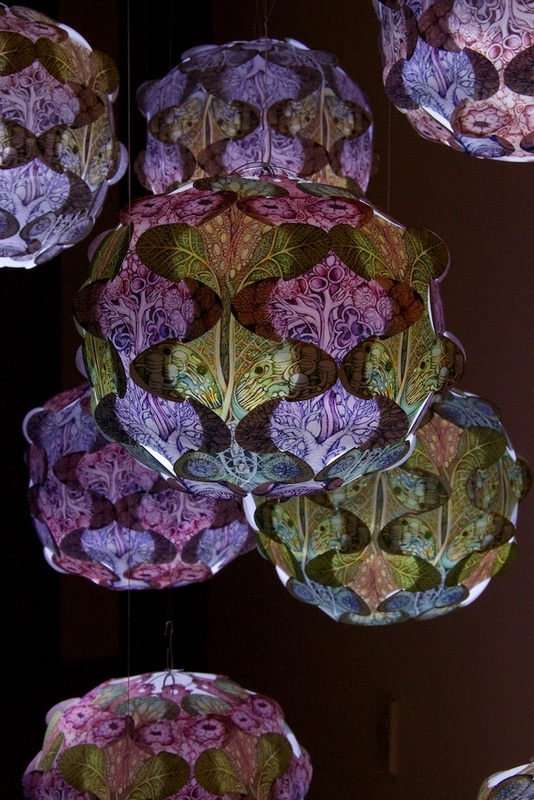 Four lamps, two with the interlocking motifs of the carbon cycle: human lung and leaves/algae/chloroplasts. A second with only lung-pattern and the other with only chloroplast pattern. These two are communicating at a distance, but dependent upon the gas each other organism produces. Story: I often express the relationship between humanity and nature in a visual dialectic of natural organic shapes and man-made, Euclidean constructions. Through this opposition, I question our increasingly artificial society and a growing alienation from its natural origins. I am now working on the Breath of Life project, which explores early lung cancer detection research. A sidestep this year, from my more environmentally themed work. I have been an artist in residence at the Keck School of Medicine at the University of Southern California last October, at the lab of Dr. Ite Laird. So she would be the collaborating scientist on the Breath of Life project. However, the piece I am proposing for the Living Data project can be connected to the research related to algae and the role of diatoms in the carbon-oxygen cycle in our atmosphere. Healthy air is important in a city and dependent on the cycle between our intake of oxygen produced by photo-synthesizers such as plants and (marine) algae, which use the carbon dioxide we exhale. I am developing lamps from plastic film, made by interlocking elements of plants, specifically the chloroplasts that photosynthesize. The marine version of a diatom is depicted as well. The colours will be in blue-greens, and browns. I am printing my drawings digitally on EPSON backlight film. Lisa remarked on the similarity in structure of haemoglobin and chlorophyl, which could go for another lamp element, which increases the amount of elements to combine. Something I will pursue for sure, but probably not able to finish before this exhibition. The lamps can be a developing organic project. Methods: Hand drawings in pencil are scanned and manipulated in Photoshop and Pixelmator. Resulting digital images are printed in high-resolution on Epson backlight film. The drawings are made to scale, the same size as the prints. Printed sheets are handcut into the separate segments, which are then interlocked and secured at the top with handmade aluminium hooks. Small LED pocketlights are suspended into the lamps. The material of backlight film is opaque matte and looks like paper, but will be translucent when light strikes through it. So the best effect would be to place an energy efficient lightsource (LEDS) inside the globe. The lamps will have a ring inside which can be used as a base to set them on a surface, or to hang them as lamps. This depends on location and installation budget. It may be easier and cheaper to position the lamps on a surface/plinth/table etc. I personally prefer the idea of hanging. You could suspend them using a long electrical cord with an energy efficient lightsource in it. The lamps are very easy to ship, as flat unfolded elements. They are not difficult to put together. Living Data will have to provide the lamp inside them and electrical that goes with it. 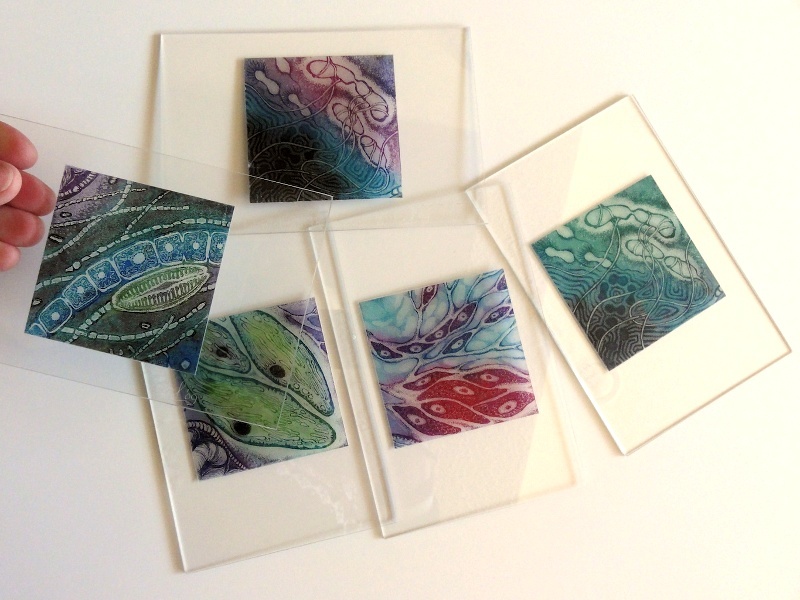 I will also create a transparent clear, thin acrylic disc, into which the elements will lock for integrity, and which will be the disc through which the electrical cord can go to hang the lamp. I cannot show you a prototype at this stage as I still have to make it, but it is simple and will work. As for size: the prototype is 26 x 26 x 26 cms. However, since they are digitized, I can create smaller and larger ones. In my ideal world, there will an installation of many of these lamps suspended in different sizes, some with colour shifts. One thing you need to know about the design of the lamps: I have actually appropriated an existing IKEA design (who kind of appropriated it from Noguchi). I have had one of these lamps in my studio for years, with the idea to screenprint on it, and when the lung project came up, the idea of interlocking oxygen/carbon elements fell into place naturally. By printing directly on backlight film, I am not using actual IKEA made elements. Bio: My art evolves out of my interest in the diversity of human culture and fascination with patterns and processes found in nature. They are interrelated, as human culture is highly determined by its natural surroundings. I often express the relationship between humanity and nature in a visual dialectic of natural organic shapes and man-made, Euclidean constructions. Through this opposition, I question our increasingly artificial society and a growing alienation from its natural origins. Inspiration for my work flows from exploring the concept of the Biosphere. Russian scientist Vladimir Vernadsky, was the first to define this concept of living matter being inseparably connected within the geological envelope of the earth. Even at the beginning of the 20th century, he realized how humankind was involved in the whole biosphere and the extent to which humanity contributed to changes in the biosphere as a result of its thinking capacity. He called this the "Noosphere", or "conscious layer of life". In recent work I have focused on marine environments. The environmental threat to the coral reefs is a personal issue, as I have lived in the Caribbean during my teens and spent a lot of time diving and observing marine life. Upon returning in recent years I have observed the spectacular decline of the coral reefs. Currently, I live in Alberta, Canada, where the reefs are close to me as ancient geological formations. In these millions of years old Devonian formations Alberta's oil-wealth is sequestered. It is ironic that fossil fuels, which are extracted from these geological reef formations, endanger the current living reefs. Acknowledgements: This work was supported by an artist in residency at the Keck School of Medicineat the University of Southern California in October 2013, at the lab of Dr. Ite Laird who is the collaborating scientist on the Breath of Life project. Residency and production costs were provided by the Alberta Foundation of Arts, Alberta, Canada.